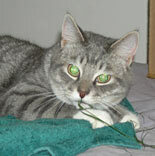 Finnegan nibbling on a blade of grass. Here are some CR!FR banners for those who'd like to put one on a website. We greatly appreciate the hand in getting the word out. Please drop us a line & let us know the URL the banner appears on.